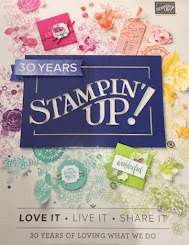 Today's project features the Window Shopping stamp set from the Occasions catalog. This set does come as a bundle, but today I'm only using the stamp set. This week I'm also going to be sharing some different card folds. This card fold is like a split panel and you can hide a sentiment behind the center image.